I am hoping by now, most people I know, know I am walking The 3 Day. If not, I’m not doing my job of letting everyone know, or asking for donations. I am creating a tutu that I will wear on the walk. The goal is to raise money towards my goal of $2500, and also recognize people who have fought breast cancer and either beat it, or lost their battle. 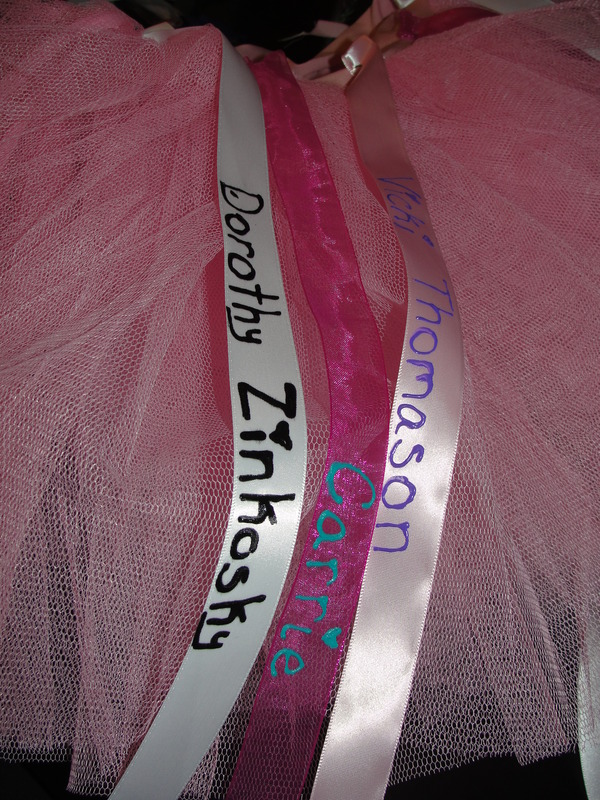 I am selling ribbons for a minimum donation of $2 per ribbon. You may choose a light pink ribbon or a hot pink one (for survivors or people currently fighting), and white ones in memory of those who lost their battles. If you’d like to donate, you can do so several ways. You can donate online via my donation page, you need to click the “donate” button on my main fundraising page. You can also send me a check made out to: “Susan G Komen 3 Day”. You need to write my participant number: 5773378 on the memo line. If you want to send a check, please send me a message. If you are someone I see in person often, I can take cash. I have a jar I’m putting the cash all in, and before the event, I will turn it all in. Donating online or via check will get you a tax-deductible donation receipt. Oh, and remember, many companies will match your donation. If you donate online or via check, you can see if your company will match it. Besides the donation, I will need to know the name of the person you are donating in honor or memory of. You can give me their first name only, or first and last. I have even had a friend request simply “Grandma.” Of course, if you don’t know anyone who had been affected by breast cancer, you are lucky. I’d appreciate your help. Please ask around your offices. Ask friends and family members. Forward this post. 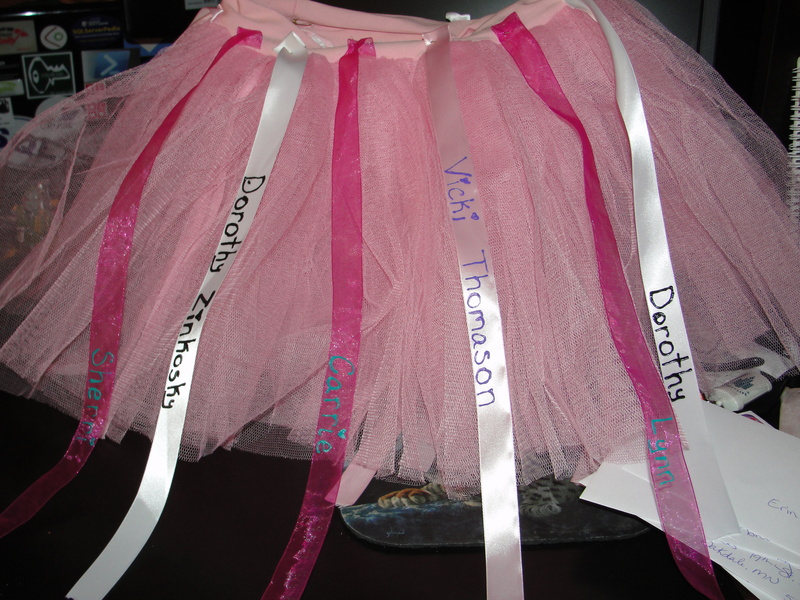 My goal is to fill the entire tutu with ribbons. I want to honor as many people as possible. Honor them for their fights with this horrible disease, and remember the ones who were not able to beat it. I would love to, at some point in the future, see a 100% survival rate for not only breast cancer, but any cancer that might try to take on the human body. Right now, it might seem like a dream, and not reality, but I believe that if we keep raising funds for research, cancer will, some day, become curable ALL THE TIME. I also believe in raising money to help men women who might not be normally be able to get mammograms, receive the potentially life saving tests. That is why I am walking. 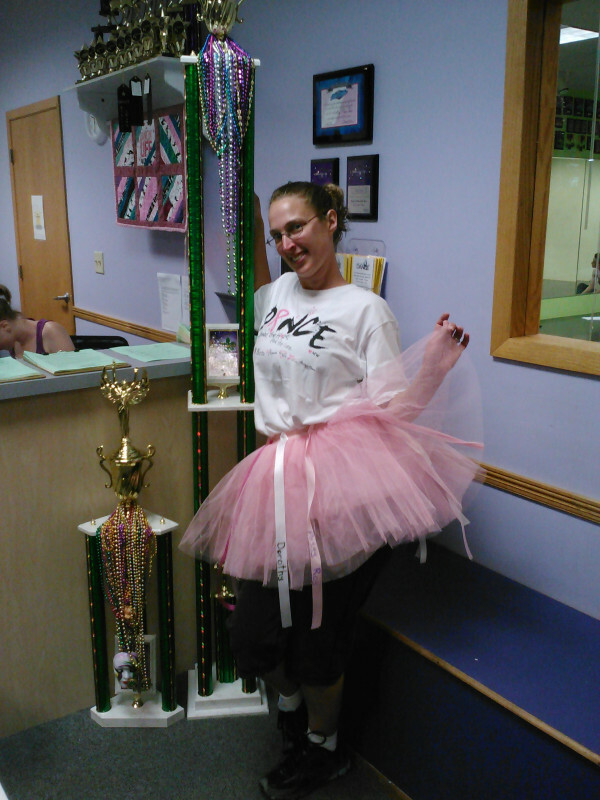 That is why I am creating this tutu. I will proudly wear it all 60 miles. I wold love to donate for you. I wish I was closer I would walk with you…. Thank you! It would be great to walk with you! I appreciate your donation, and your encouragement!